"Let's Talk about Palliative Care"
Palliative Care is specialized medical care for individuals diagnosed with serious illness- at any age, any serious illness, and any stage of health. We offer 3 webinars to help consumers & care providers start meaningful discussions from first diagnosis of a serious illness, during curative treatments, through to end of life care. Everyone can start with "What is Palliative Care? - 5 Minute Introduction", and download free tools. Join us for an exclusive conservation and screening of "End Game", a powerful new documentary featuring the stories of three patients at the end of life. It's a portrait of families and clinicians working through complex issues around honoring patients' wishes and sometimes making difficult decisions about the course of care. Shoshana Ungerleider, MD, one of the executive producers, will join a panel and audience discussion following the screening. March 18, 5:30-7pm, Blue Cross Blue Shield of MA, 101 Huntington Street, 12th Floor, Boston. Co-sponsored by MA Coalition for Serious Illness Care and Honoring Choices MA, in collaboration with the Endwell Foundation. Host a Train-the-Trainer Ambassador Workshop! Our 250 Ambassadors are confidently helping adults complete a Health Care Proxy & Personal Directive (Living Will), anywhere adults live, work & gather! Your group can host a free Health Care Planning Ambassador Train-the-Trainer Workshop to educate your staff & volunteers in time for your April community events. You supply the location; we'll offer the training & tools. Our North Shore Partners, Harvard Vanguard Beverly & North Shore Elder Services, are hosting two trainings on March 25 & March 28. All care providers welcome! Want to host a workshop? We welcome Greater Lynn Senior Services, Jewish Family Service of Metrowest, and Valley Medical Group to the Community Partner network. Lynn, MA. 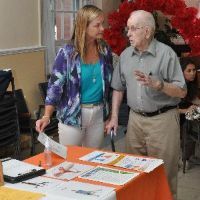 Sylvia Colovos, Move Safe Coordinator, Greater Lynn Senior Services (GLSS), is talking with a consumer at “The Kiosk for Living Well”, their one-stop health education marketplace. GLSS' kiosks help North Shore adults with health self-management, through information, tools and virtual technology. Framingham, MA. 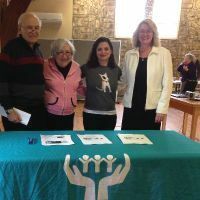 Abrielle Salloway, LCSW (second from right) host's a "What's in Your Plan" Lunch & Learn for Jewish Family Service of Metrowest (JFS) members. JFS provides vital social, health and community services to alleviate suffering, enhance lives and support people in need. Northhampton, MA. Valley Medical Group helps their patients in Western MA live better, longer lives through early detection and preventive medicine. 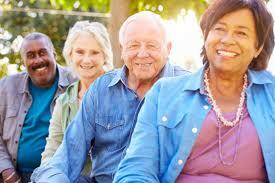 They are committed to understanding & honoring a patient's care choices all through their lives. "Conversations on the Rise: Weaving ACP Billing Codes Into Your Practice for Multiple Advantages." “The data shows there has been a steady increase in the number of Advanced Care Planning conversations billed by physicians in Massachusetts,” says Dawn Hobill, Senior Program Administrator, Healthcentric Advisors, and Honoring Choices Partner. This is good news for both consumers & care providers. Weaving ACP billing codes into your practice makes early & on-going planning conversations more routine, while advancing and reporting on quality care and coordination measures. In case you missed it, here's a fun read of our collaborative achievements in 2018. Copyright © 2013-2019 Honoring Choices Massachusetts, All rights reserved. and connect to person-centered care.